The Orange Public Library is located in the City of Orange, California. It was founded in 1885, making it one of the oldest public libraries in Orange County. Postmaster Robert E. Tener donated his collection of about 300 books and ran the library as a private organization, using dues from the members to build and maintain the collection. The library itself was housed in the Post Office Building on South Glassell. It remained as a private organization until 1894 when it was turned over to the city. In 1905, the collection needed a new building and was granted a Carnegie building to house the library on the corner of Center and Chapman, where the Main Library is still located today. In 1961, the original Carnegie building was demolished and the current 17,000 square foot building was erected, increasing in size to provide service to an anticipated population of 40,000. 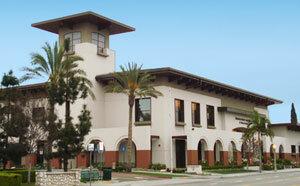 An expanded new Orange Public Library & History Center reopened on April 21, 2007. At 45,000 square feet, the new library building includes a Children’s Library, Teen Zone, Homework Center and a History Center. Orange Public Library welcomes and supports all people in their enjoyment of reading and pursuit of lifelong learning. Together we strive to preserve local history and to provide equal access to information, ideas and knowledge through books, programs and technology. We believe in the freedom to read, to learn, to discover.